Productivity apps are a great way to keep yourself—and other members of your team—organized, accountable, and focused. Whether you work in an office, a shared workspace, or from the comfort of your home, distractions are inevitable. That’s why we’ve created the following list of the best-of-the-best productivity apps. Some from well-known companies (like Google and Skype) and others from lesser known, but equally as trusted brands (like LastPass and Toggl). From passwords and notes to meetings and lists there’s a lot to keep straight when you’re not only managing your life but all aspects of your job too. These apps will help. Having to enter and re-enter your login information to websites you frequently visit can be a real hassle. That’s why the LastPass app is super helpful for busy freelancers. 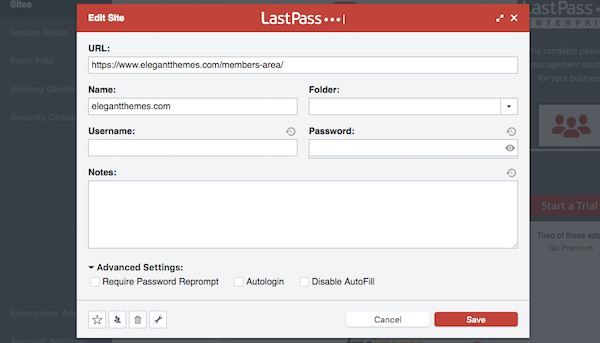 By saving the username and password for websites you visit the most, LastPass cuts down on manual entry while also increasing your personal security (since you’ll no longer need to rely on the same username/password combo for all of your applications). Evernote is an extremely flexible tool. If you’re looking for an easy way to capture your projects’ notes, start with the free basic plan. For more advanced note taking, sharing, and analysis, you’ll need one of the more comprehensive plans. And as your business grows, you may want to consider signing up for Evernote’s Business plan which includes more project management tools and integrations. The three big calendar apps are iCal, Google Calendar, and Outlook. And for most people, those work. But if they’re not quite cutting it for you then something a bit more sleek, powerful, and integrated–like Fantastical 2 by Flexibits–may be just what you’re looking for. Fantastical is available for Mac OSX and iOS. It syncs with all major calendars, has full time zone support, reminders, availability scheduling, quick access mini-window, maps/locations, instant Google updates, light and dark themes, and unique “calendar set” views. Checklist lovers, rejoice! Wunderlist is the desktop productivity app you’ve always wanted. With this tool, you can keep your task lists readily available, easy to manage, and make them available for sharing—with others and across all your devices. Paper by FiftyThree is a multi-purpose app that turns your mobile device into “paper”. Take notes, create checklists, annotate photos, create sketches, and more with this all-in-one writing/drawing app that allows you to stay inspired and capture your thoughts while on the go. Pocket is very similar to Feedly in that it’s an aggregator app. Basically, if you stumble upon an article or a resource but don’t have the time to check it out right now, you just add it to your Pocket for later. This app just so happens to have a highly intuitive interface regardless of which device you use it on, so this is for the developer that wants to aggregate sources regardless of where they are. Feedly is an awesome app, for a couple of reasons. If you’ve ever seen something online and wondered if you should take the time to read it, just bookmark it for later with Feedly. Feedly also happens to be a great way to aggregate all your favorite content in one place (for social media purposes or as a personal reading outlet). So if you’re looking to maximize your free time/break time, get Feedly so you can do all your reading in one place. Many freelancers spend a lot more of their time administering their business, managing clients, and putting out fires than working on…work. Or at least it can feel that way. These apps will help you cut through the noise and focus on what’s most important. When it comes to the contract and invoice piece of your business, the more you can templatize and automate each step of the process, the more time you’ll have to focus on your work. Bonsai is a particularly great choice for this with it’s pre-made contract templates, automatic invoice generation, and flexible payment processing. For freelancers who don’t want to have to actively track time spent on tasks—for yourself or for other members of your team—you’ll need a time tracking app to take care of that for you. Harvest is a great one to look at, especially if you’re billing clients based on task completion or actual time spent. This app integrates with a number of project management and finance tools, which makes invoicing and reporting much more hands-off, too. For freelancers with too many moving pieces and daily contacts, you need a platform that will help keep everything in one place. If you’re trying to grow your business and do a better job at balancing projects, a project management platform is a must. Asana is a great choice if you’re a solo freelancer and want an intuitive and flexible interface to work from on your mobile device. Project management apps help you stay organized and keep all project-related items centralized. You can store files, communicate with other team members and clients, create to-do lists, schedule out projects, and more. And perhaps the best part about a comprehensive project management platform like Basecamp? All the third-party integrations it comes with. 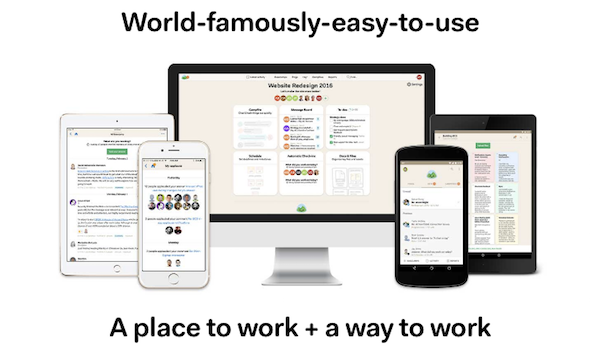 Want a task management tool that’ll go with you everywhere? Any.do might just be the tool you’re looking for then. With easy to-do list setups, project management, and team conversations, Any.do will optimize your time spent keeping control over all the little pieces constantly floating around. 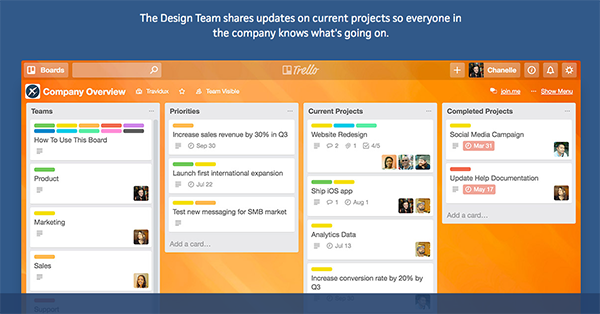 Trello specializes in visual task and project management/collaboration. With its boards, lists, and cards it’s easy to implement any number of project management and productivity best practices for you and your whole team. Are you a loyal Apple user looking for a better way to manage all of your personal and professional tasks in one place? The Things app makes it easy to enter new tasks, track daily project loads, and keep your personal itinerary synced up with your professional responsibilities. The Clear mobile app is another task-tracking tool worth looking into. The simple, clean, and colorful aesthetics of this app make it one of the more popular ones on this list, and for good reason. So if you want a way to easily track person activities, professional tasks, and follow-up reminders, give this a try. Want to take the guesswork out of when you have free time to pencil in a prospective client interview or manage those reworks that keep getting pushed out? The Free Time app will help you figure out when you’ve got time to spare. Let’s face it: the internet is full of distractions. These apps will help–make that force–you to stay on task when all you want to do is look at the latest trending story or funny video. Distraction blocker apps like StayFocusd actively monitor the websites you visit and help you avoid distractors like social media, Wikipedia black holes, funny cat videos, etc. As a WordPress developer, it’s especially important to be careful about how you set this app up. You won’t want WordPress or other work-related sites accidentally getting blocked. Have you ever wondered how much time you actually work in a day? Or maybe you need to get a better handle on how much to charge for your services? If you’re looking for better insight into what your time is actually worth and whether or not you’re making the best use of it, time tracking apps like Toggl will help. Time trackers are easy to use and serve a number of purposes in terms of productivity. You input your project or task, turn the timer on when you start, and then turn it off when you’re done. You can run reports in these and monitor other team members’ productivity as well. Do you ever worry about how much time you’re losing when you take “just five minutes” to look over at Facebook? With Freedom (and other distraction blocking apps), you don’t have to worry about that anymore. You can actively block the websites that commonly distract you from your work, and start getting more regimented about taking breaks. It’s good to get into a rhythm with your work. But its in-efficient if you spend a lot of your time repeating the same tasks. Instead, use these apps to automate tasks you find yourself doing over and over again. While project management tools are great for keeping conversations, files, and project notes all in one place, they’re not necessarily built for automating and centralizing the actions you commonly make. 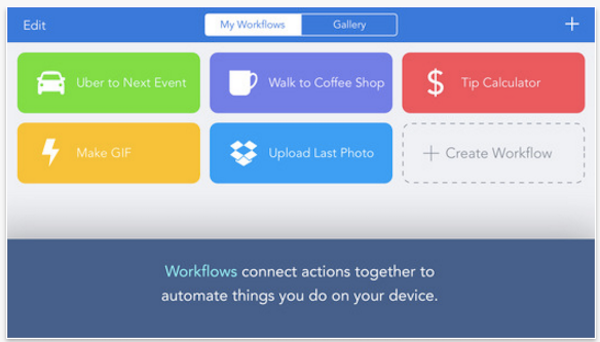 So if you’re in and out of the same apps on a regular basis, Workflow app connect them in an easy-to-set up tool. Many people have a love-hate relationship with their mobile devices. While they’re super convenient for taking care of personal and professional activities while out and about, having to type out messages and emails with that super-small keyboard can get frustrating. This app expands your keyboard so it’s easier to type and also saves your most commonly used fragments of text so you don’t have to type them over and over again. If you’re a web-designer, as many of our readers are, then you know there are a great many aspects of a web design project that are more or less the same for each and every client, even if the end results all look different. That’s where our own visual website builder Divi (and its core feature, The Divi Library) come into play. With Divi you’re able to create, share, purchase, and download pre-designed page layouts for any and all project types. You can quickly install them with a few clicks and deploy them just as easily. We’ve even created a bunch of professional quality layouts for free as a gift to the community. Most freelancers work remotely. These apps can help you better collaborate with clients and/or team members you can’t always get in the same room with. All Google accounts come with access to Google’s rich suite of web apps: search, email, maps, calendar, drive, hangouts and more. But with Google Apps for Work you get some added premium features that can supercharge your professional life and team collaboration. Features like a professional email address, added cloud storage, and business-grade security. For freelancers with smaller businesses or startup budgets, you can skip the project management software for now and get the Dropbox app. While this particular tool is mainly used for file storage and sharing, it’s an essential piece in any freelancer’s business and is always a great place to start if you’re looking for greater organization and productivity. 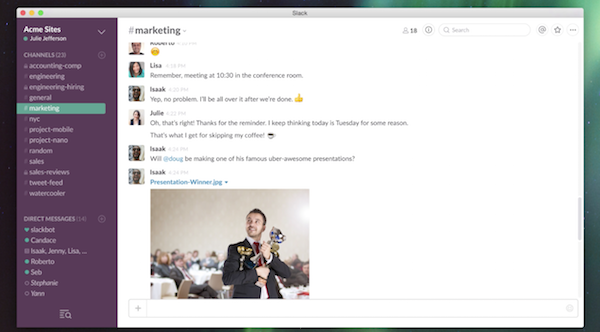 Slack isn’t just about instant messaging. You can create separate channels for different clients, teams, private/personal needs, or conversation topics. It’s also a great way to share photos, documents, project updates, milestone celebrations, and more. When you’re working with a team that’s located around the country or globe, it’s sometimes difficult to reach team members if they’ve got their heads down as they focus on their work. 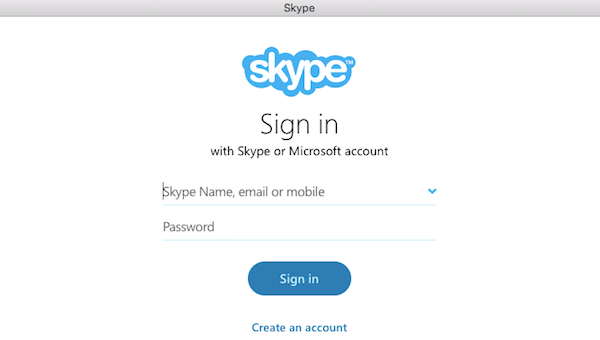 That’s why having a versatile real-time communications platform like Skype can help busy freelancers get instantaneous feedback and insights when they need them. Teleport is a suite of products that helps you find and then move to the right city, no matter where that city may be in the world. Then, once you’re there, they’ve got a few cool tools to help you work remotely. One such tool is their Sundial app. This app allows you to view and compare the work hours of everyone in a given group. Perfect for distributed departments or whole companies. For freelancers with a lot of clients, prospects, or team members, coordinating schedules can be a real pain especially if you’re all using different email and calendar systems. You might not notice it, but a lot of time can get wasted when trying to coordinate meetings. Scheduling assistant apps like Doodle simplify all this. You just send a link to the calendar—which shows when exactly you’re available—and your clients and team members can schedule time when you’re actually free. Visual markup tools give you the ability to better communicate with team members or clients who may not be as design savvy or speak the same technical language as you. All you need to do is upload an image or screenshots of your website (or whatever you need critiqued) and then let your clients draw, highlight, and comment on your work. Invision is the perfect app for freelancers and teams whose project management work revolves around design. Internal and client discussions, design prototyping, mockup markups, and more are all included in this singular tool. If you’ve built out a rigorous website development process with multiple design phases, you’ll need a multi-platform app like this on your side. If you’re a freelancer then you’ve got a lot on your plate. The apps we’ve gathered together in this list are designed to help you bring order and efficiency to a chaotic web of tasks, projects, clients, and life in general. Which of these apps to you plan on using? Great collection of info. 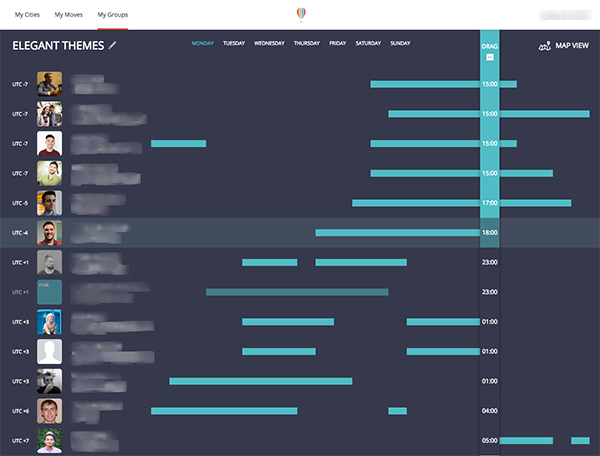 I use Toggl since 2015 and I’m totally happy to have my time recorded in a clean and detailed interface. I also found really useful use Grammarly to quick check my post and article for grammar mistake. Thanks for the suggestion, Moka! I also really like Hemmingway. Both are great tools for writers and editors. It bothers me how so many lists of apps include things only available on one platform- particularly the Apple ecosystem. This despite this week’s news of a well-respected app developer being yanked from the Mac App Store for no reason. When you choose tools locked to one ecosystem, you are placing a bet. What happens if Apple pivots and using their ecosystem doesn’t work out for you? After all, they’re in it for them, not matter how much they say they’re in it for you. If suddenly you can’t do your work in their ecosystem and that’s all you’ve invested in, what seemed like a good productivity choice will suddenly be a prison and your productivity will be down to zero for as long as it takes to change everything in your life. That said, there are a number of apps in this list that work across platforms- and are excellent. Thanks for the article. I think you forgot podio, a great project management tool. Wow, a great list and well-organized. I want to plug Any.do (and its companion, Cal which is, obviously, a Calendar app). Super simple apps. Cal shows your tasks and also pulls in events from major calendar APIs like Google and, I assume, whatever they use on iOS. These apps work on Android and iOS. I also really, really love Trello. I was sort of frustrated at how many of these are iOS only. That’s just annoying. I’m not a developer so I don’t understand the ins and outs of writing code for both platforms but it seems like they think iOS users are better, and it gives me a negative feel for the developers who do that. This is a great list of very useful apps, thank you! I’d perhaps consider swapping number 6 (Pocket) and number 7 (Feedly) because you make a reference to Feedly in the description of Pocket. Don’t forget 17Hats. It’s invaluable for freelancers. Trying out 17Hats right now! If it can help do what it says it can help me do (I know that now tool is any good unless you commit to using it) I will gladly fork over the $40.00 ($53.16 for me and my fellow Canadians)/mo for it! I use Wave for all my accounting and invoicing (free) and I use HubSpot for our CRM (Also free). I use RingCentral to automate some of the support questions I was constantly getting, for example resetting a password or how to create a post etc. RingCentral isn’t free though, ands it’s charged per user. But if you set up forwarding rules, you can have almost unlimited users receiving phone calls. I used to use google voice, but had some issues. AND CO is also great! Thanks this is really helpful! I ended up signing up for basecamp to have my clients send me their tasks. Great list. I currently use a few of them but I’m very interested in Harvest for time tracking, might try it out. Don’t forget Microsoft OneNote, is the better option for me after trying Google note and ever note. Thanks for the list of resources. I use ToDoist for tasks away from my job, Evernote as a read-later app and library of notes/articles/etc, and Trello for project managment/tasks at work and some fun stuff away from work. I moved to ToDoist for managing daily personal list/calendar this summer, moving away from Trello, and I’ve really liked it. Trello still works for a lot of things though, and I couldn’t live without it at work. 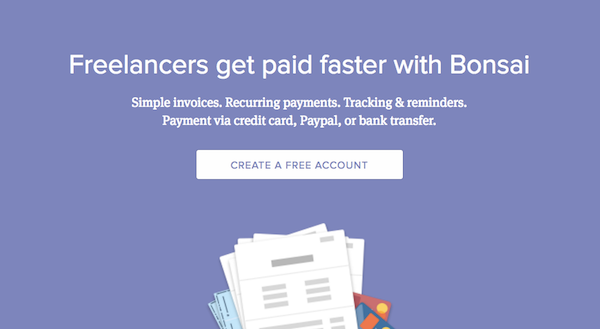 Pancakeapp is pretty good for freelancers as well. Time tracking, billing, project management, quoting, etc. Buy once and use forever. I just love LastPass. It has changed the way I work with my clients and I always recommend it to them. And I’ll definitely test the Teleport Sundial, thank you! Nice list. Evernote, Dropbox, google drive and Podio then you are running pretty good! And yes (John) they might forgot to mention Citrix Podio as an ultimate tool for CRM, project management, time registration, etc. At all a very good inspiration, thanks to all comments! @Nelson. I’ve been using Harvest Time Tracking since May and it’s great. First off it integrates with many, many other apps (like Trello, Google Apps), too. The generated invoices look great. It includes options to account for retainers, expenses, and has budget alerts. You can attach your work products (I usually take screenshots), to give the client a visual reference. If you forget to turn the timer off, it’ll send you an email reminder (if you leave it running overnight), or if you just step away a pop-up will remind you: “do you want to remove x minutes of idle time”. It’s honestly my favorite app. I wish it would integrate with Freshbooks accounting software, but that may still come. Mobile versions are also available. Thank you for this post, I would highly recommend last pass to anyone. I have recommended it to many of my clients! I’d also recommend Freeter. It makes it sooo easy to jump between projects! Group project files, Trello boards, Invoicing app, and other apps you use on dashboards, and you can easily access anything you need in a second.